Rohde & Schwarz will welcome its visitors at Mobile World Congress in Barcelona from February 25 to 28, 2019 in hall 6. Focus topics at the two booths (6C40 and 6C51) will range from solutions for 5G NR, mobile networks and the internet of things (IoT) to wireless connectivity and connected cars. And for the first time at MWC, Rohde & Schwarz will showcase its 5G Broadcast solution. From components and chipsets to assembled user devices and base stations, Rohde & Schwarz test solutions help the industry bring 5G NR products to market more quickly and reliably. At MWC 2019, the T&M expert will display a wide range of novel test and measurement solutions for 5G NR device and base station testing in the sub 6 GHz and mmWave frequency ranges – also known as FR1 and FR2 – for both development and production. For example, Rohde & Schwarz will showcase its solutions for signaling and non-signaling testing of 5G NR devices, including two new wireless communication testers. Since traditional testing is not suitable for the active antenna systems used in upcoming devices, Rohde & Schwarz has developed innovative over-the-air test solutions based on shielded test chambers. This includes a solution for testing in extreme temperatures ranging from –40 °C to +85 °C, as well as a compact antenna test range setup (CATR) for device verification and conformance testing. The company will also showcase novel cloud-based testing concepts that leverage the benefits of cloud computing for advanced test applications. Automated test scenarios, e.g. for 5G NR base station testing, benefit from fast data processing for signal analysis. Mobile network operators endeavoring to take advantage of 5G must overcome the challenges of the increasingly complex air interface and demanding use cases in order to deliver the required quality of experience (QoE) to end users. At MWC 2019, mobile network testing solutions presented by Rohde & Schwarz enable operators to seamlessly cover test scenarios and technologies over the entire network lifecycle from the lab to the field. One of the highlights is the Smart platform, a Rohde & Schwarz software suite that combines high-quality data acquisition with intelligent analytics to generate QoE-centric network insights, allowing operators to identify critical factors influencing network performance. The Rohde & Schwarz SmartAnalytics software features the integrated network performance score (NPS), a single quality metric methodology that provides the ideal point of reference for facilitating targeted improvements in network quality and performance. Other highlights include the world’s first mobile network testing solution for 5G NR, enabling operators and infrastructure vendors to measure 5G NR network coverage, performance and operation to ensure that when 5G transitions from trial networks to commercial deployment are made, these networks deliver the required performance and quality. The consumption of mobile video content is rapidly increasing, and there are limitations in covering this demand and satisfying mobile consumers’ QoE via current mobile network infrastructures. To address these issues and enable new business models, 3GPP has defined major standard enhancements with FeMBMS (Further evolved Multimedia Broadcast Multicast Service) in Release 14. At MWC 2019, Rohde & Schwarz will present a solution for the future of media delivery based on these enhancements. By deploying a high-power high-tower (HPHT) network topology as an overlay, the distribution of media & entertainment content will be more efficient and cost-effective. But there is more – mobile consumers of live content such as major sports events will benefit from highest video quality (beyond HDTV), low latency and ensured availability of live streaming services. As part of the Bavarian research project 5G TODAY, Rohde & Schwarz is investigating large-scale TV broadcast transmissions in the FeMBMS mode in an HPHT 5G Broadcast field trial near Munich. At MWC 2019, the company will highlight the advantages of this technology via live transmission to a mobile device at the Rohde & Schwarz booth. Cities will become smarter by connecting everything. Millions of connected devices that enable a smarter and safer world rely on affordable connectivity designed for decades of operation. IoT modules and components need to be cost-efficient and offer high reliability, long lifetime and security. To fulfill these requirements, Rohde & Schwarz provides comprehensive test solutions that cover IP security to production. At MWC 2019, Rohde & Schwarz will perform NB-IoT field-to-lab testing under real network conditions, evaluate NB-IoT power consumption under real-world conditions and present IP security solutions. 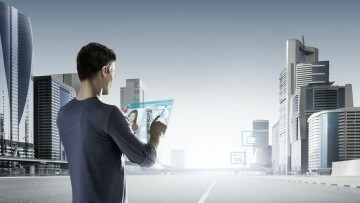 In terms of wireless connectivity, Rohde & Schwarz will demonstrate two world firsts: the first Bluetooth® Low Energy (BLE) testing solution covering both direct test mode (DTM) and over-the-air tests under signaling conditions and the first solution for WLAN IEEE 802.11ax 2×2 MIMO signaling testing. Vehicles are becoming increasingly connected. One of the technologies considered for the connected car is 3GPP cellular vehicle-to-everything (C-V2X) based on 4G LTE and with a roadmap to 5G V2X. A fundamental requirement for the successful deployment of V2X communications is robust RF testing. To address the needs of the fast advancing C-V2X technology, Rohde & Schwarz has developed a strong portfolio for the automotive industry and its suppliers. These state-of-the-art test and measurement solutions for C-V2X testing in R&D and production using well-established wireless communication testers from Rohde & Schwarz will also be on display at MWC 2019.